Eliminator A-frame Ladder: One SKU fits 48″ to 54″ above ground pools: Adjustability is made by simply moving side braces up or down depending on pool height. Heavy duty construction: Unique one piece handrail/leg design will hold 300lbs. Five evenly spaced steps make climbing the ladder easier: Most other adjustable ladders increase the space between the bottom step and the next step when installed in a 53″ or 54″ pool. Outer steps swing up and lock into upright position: Some building inspectors now require this instead of a lift-off ladder section. No sand required; just fill with water to prevent floating. Most other ladders use a bag filled with sand. Converts to an inpool ladder with optional CK100 Kit: Just cut ladder to desired length. Two tone color: white and grey: Complements today’s pools. 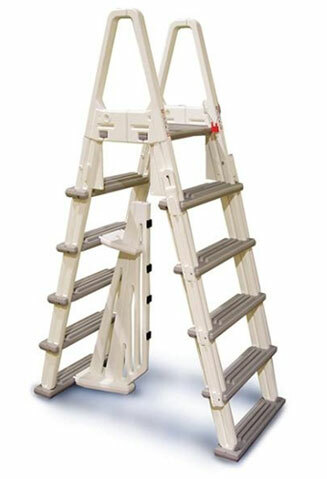 Competitively priced: Compare all of our features with other manufacturers’ ladders. Safety first: Ladder now comes complete with a padlock for added safety benefit. # 7000-EXT Extension kit available for 56″ tall pools. © 2019, Duckman’s Pools LLC. All Rights Reserved.